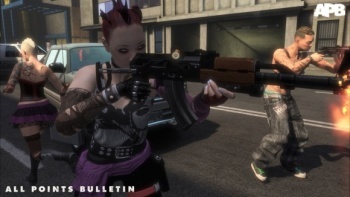 Not one, but two companies have set their sights on the staff of APB developer Realtime Worlds. It was only yesterday that Realtime Worlds announced that it was entering administration, putting nearly 200 jobs in jeopardy. But Activision and Blitz Games are wasting no time in trying to recruit the struggling developer's staff, and have flown representatives to the Scottish city of Dundee to hold interviews with interested parties. Tomorrow evening, Activision will highlight its available positions both inside and outside the UK in a special presentation, and then on Friday it will hold selected interviews for what are described as key vacancies. Blitz Studios, whose Volatile Games division developed Dead to Rights: Retribution will also be talking to RTW employees on Thursday and Friday. CEO Phillip Oliver said that RTW staff would be "pleasantly surprised" by the opportunities that Blitz could offer. While at first glance this looks like Activision and Blitz are kicking Realtime Worlds when it's down, realistically this is probably the best thing that could have happened for the RTW staff. Unless the studio can find an investor, most of them will be out of a job, and with APB receiving such a lukewarm reception, securing more funding may prove incredibly difficult. Losing a significant portion of its staff will obviously further reduce RTW's value, but it's debatable as to whether it would make any difference at this point anyway. We'll have to wait and see how this situation develops, but hopefully it will end in the best resolution for all concerned.